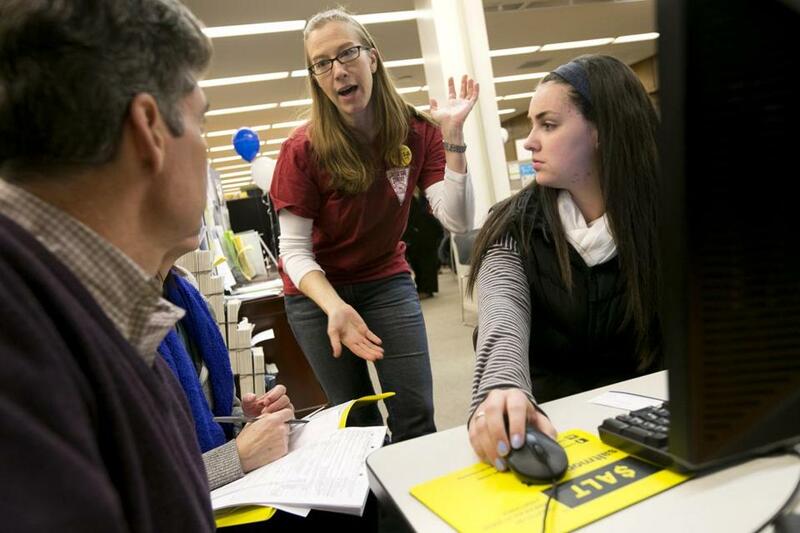 Liberty Collom, a senior assistant director of financial aid at Boston University (center), helped attendees at FAFSA Day at Boston Public Library Sunday fill out forms. Jeasebelle Soto’s “dream schools” are Northeastern University and Providence College, but the Beverly High School senior is finding that their $40,000-plus annual price tags are anything but ideal. Which is why Soto and her parents were eighth in line Sunday for a free session at the Boston Public Library — one of many held across the state — to help college-bound students decipher the complex form known as the Free Application for Federal Student Aid, or FAFSA, which is critical in obtaining coveted financial help with college. As the cost of a college education continues to climb, along with the amount of debt that students and their families are saddled with at graduation, financial aide administrators advised families at the counseling sessions to scour the many sources of potential aid, both public and private. “When I was going to college, I applied to 22 outside scholarships and I got two of them,” said Keith Curtis Dimalanta, a financial aid counselor at Northeastern University and 2008 college graduate, who was one of many area school administrators to volunteer at Sunday’s FAFSA Day help session. The tedious application process “stunk,” Dimalanta admitted, but it helped reduce his annual costs by $4,000. This is the 10th year that financial aid leaders have banded together to offer free, one-on-one assistance with the documents, an event that has served more than 11,000 students during that time, organizers said. Although college costs have finally started to slow their ascent, they are still rising, according to a 2013 report from the College Board, which also found a dwindling of federal financial aid after several robust years. College graduates who borrowed for bachelor’s degrees granted in 2012 had an average student loan debt of $29,400, according to a December report from the Institute for College Access & Success. The report found that since 2008, these debts, from both federal and private loans, increased an average of 6 percent, each year. “It has become more difficult to come out of college with a reasonable amount of debt,” said Jane Horton, a senior manager at American Student Assistance, a nonprofit that provides education about student loans. The Doyle family started researching the financial assistance process more than a year ago, but they were still perplexed as they huddled around a computer with a counselor at the library session. Libby Doyle, 17, a senior at Milton High School, wants to be an elementary school teacher. She is considering Emmanuel College, with tuition and fees in excess of $47,000 a year, and the University of Massachusetts Amherst, which is about half that, or “more reasonable,” as her mother, Elise put it. The Doyles, who also have a 16-year-old and a 13-year-old, figure they will be more seasoned in the process by the time their youngest applies for college. So do the Edwardses, who were gathered around a nearby computer to get assistance for their daughter Bevin, 17, a senior at Natick High School. They also have two younger children: one in sixth grade and another in third grade. The Edwardses were trying to figure out how much federal financial aid they might qualify for, given the family’s income. “They told us we are not low income, and we are not high income,” said Winston Edwards, Bevin’s father. Which means, the family discovered, they will be in that highly competitive middle ground, scrambling for those coveted dollars. Kay Lazar can be reached at Kay.Lazar@globe.com .